This time of year when the super cold and miserable days have passed (fingers crossed), but the new season’s produce is not yet available is when I struggle the most with coming up with delicious and inspiring meals. Lately I’ve been weathering this ‘season’ by eating lots of steamed cabbage (my annual end-of-winter staple), keeping it lively with some hearty winter salads, lots of pancakes and waffles, and putting a new spin on ‘classic’ recipes. Like turning a fruity-dessert-crumble into a savory one-dish dinner option with whatever is on hand. 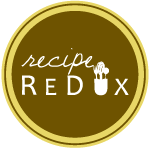 In tune with the way I’ve been cooking, The Recipe Redux challenge of the month is to be resourceful and Spring Clean Your Kitchen by cooking with ingredients that are actually on hand now, trying not to go to the store to buy anything new. This one has my clean-out-the-fridge vegetables with golden beets, turnips, onions, garlic, mushrooms, frozen peas, and cooked Lima beans all stewed together with a creamy ‘gravy’ and topped with a savory crumble topping. I’ve made variations of this so many times and equally love topping it with quinoa flakes, which are not consistently stocked in my pantry, or old-fashioned oats, which definitely are. Go ahead and change it up depending on what you have. It will be delicious just about any way you go about it. There appears to be lots of ingredients here but they come together quickly. Use what you have and simplify or substitute as needed. This was originally inspired and adapted over many versions from Chickpea Flour Does it All. Preheat the oven to 375 degrees F and get out a large baking dish, such as a 11-inch pie pan or 9×13″ pan. Combine all the vegetables, mushrooms, and Lima beans in a large bowl. Add the seasonings and water or bean liquid and toss everything together to coat. In a small bowl, whisk the arrowroot starch with a small amount of water and then pour into the vegetable mixture and stir once more to combine it. Transfer the mixture into the baking dish and set aside. Make the crumble topping by combining the quinoa flakes or oats, chopped walnuts, hemp seeds, and salt and spices. Mix in the coconut oil with a fork or your hands until the mixture resembles course crumbs. If it’s a little dry, add up to 2 tablespoons water. Then spread the crumble evenly over the vegetable filling and place it into the oven. Bake for 45 to 50 minutes, until the topping is browned and the vegetables are tender and bubbling. Remove from the oven, cool just slightly, and dig in! Just about every week I read a new article about the latest thing we should be eating, buying or doing for our health. Translated into actually eating food, one thing I’ve noticed is that for many people who tend to eat healthfully and particularly those that choose foods for athletes, there tends to be a lot of snacking throughout the day on products that aren’t terribly different than eating dessert…like granola. Granola in and of itself is not necessarily an unhealthy food. In fact, we could do far worse than add it into our daily and weekly routines. If you’ve been around this blog long you’ll see I love granola and would choose it as dessert over many other options. But–depending on the type of granola you buy or make, there tends to be a lot of inflammation-promoting added sugar and refined oils. These are foods that aren’t doing us any good no matter how active we are, especially if they’re being eaten daily and make up as much as a quarter of our intake, as snacks or breakfast often do. And if you have an autoimmune condition like celiac disease, hashimoto’s thyroiditis, ulcerative colitis or others, added sugar and refined oils can do extra damage. Today I’ll focus on sugar specifically. (Read more here for my take on healthful oils.) As most of us know, sugar is a type of carbohydrate that our bodies need as energy, though there are substantial differences in quality depending on the type. Sugars are naturally present in many whole foods including fruits, vegetables, grains and dairy products. In whole foods, the sugars are balanced by the other nutrients. Refined sugars like plain old white or brown sugar, corn syrup, or organic cane sugar, have been processed so they are free of most nutrients and without their naturally containing minerals, they pass quickly into the bloodstream and create an imbalance in the body. They then weaken the digestive system and force the body to use minerals contained in our bones, blood, and other tissues to attempt to rebalance itself (1). If you crave sweet foods, take a look at your entire diet and compare the quantity of sweet foods versus meat, salt, and dairy products that are being eaten. Sugar cravings might occur because the diet and body is out of balance by eating too many meat, salt, and dairy-containing foods. Thus, the body is subsequently craving expansive foods like sugar and ice cream to balance itself (2). Alternatively, you can also crave sugar because there is not enough protein compared to the amount of sugar consumed (1), or because you have a larger population of so-called “bad” gut microbes, and less of the good species, causing dysbiosis and cravings for the sugars that the bad microbes love to eat. Lastly, high stress or fatigue can lead to us grabbing for sugary feel-good foods for a quick dopamine rush, which is followed by a sugar crash a short while later. Ultimately, no matter what your lifestyle or activity level, it’s usually more health-promoting to consume less sugars of all types and more whole foods that are naturally sweet. Look to use the types of sugar that are the least sweet and most whole-food based as possible. These include dates, honey, pure maple syrup, brown rice syrup, blackstrap molasses (actually a by-product of sugar refining but it contains lots of minerals), and fruit–like bananas or apples. For some people with excessive sugar cravings, it’s best to cut it out completely and repopulate the gut with beneficial species for a while, but for most of us, a gradual reduction of sugar is more sustainable. This might mean switching both the type and quantity of sugar in baking and cooking over time, like starting with using 75% of what’s called for in a recipe. Over time, you will desire sugar less and in smaller amounts. And things that you once thought were deliciously sweet are now just–sickly sweet. Now, how about a granola recipe that tastes like banana bread and is heavy on the whole-food sugars? This is my current favorite when I’m really feeling like I need some delicious granola to snack on or have as an after-dinner treat. The addition of chickpea flour might seem a touch odd, but it makes this granola extra chunky. If you don’t care for clusters, go ahead and leave it out. Additionally, any flour will do but the choice of chickpea provides just a bit of extra protein to the mix. Likewise, using three cups of oats instead of half oats and half cereal is a great idea too. Combine the oats, cereal, hazelnuts, seeds, salt, spices and chickpea flour in a large bowl, and then set aside. In a smaller bowl, mash the bananas and stir in the hazelnut butter, maple syrup and vanilla extract. Then pour the wet mix into the dry mix and stir until thoroughly combined. Spread the granola out onto a large baking sheet and pat down firmly so the granola will be extra chunky. Bake for 35-40 minutes rotating the sheet approximately halfway through. Remove from the oven and allow the granola to cool completely on the baking sheet before removing to a storage container or to eat. 1: Pitchford, P. (2002). Healing with whole foods: Asian traditions and modern medicine. Berkeley, CA: North Atlantic Books. 2: Colbin, A. (1986). Food and healing. New York, NY: Ballantine Books. Following in the footsteps of my last post, I’m creating lots of quick and comforting meals lately. Late-winter is when I typically become the least inspired by seasonal ingredients, but this year I’ve relegated to always having some batch-cooking or roll-over ingredients on hand for ready meals. And I actually haven’t lost inspiration per se, but the hours in the day for cooking creatively and sharing those meals has been taken up elsewhere. Instead, I’ve really been putting my focus into creating space for in between moments and pauses, and it’s kind of funny to realize when life is really full and can feel rushed that pausing and watching the mind slows everything down. All that rush tends to fall away and around, instead of inside me, and I realize it’ll all get done. There are little checkoffs this season. Taking my ServSafe test and receiving certification, sitting for and passing a lengthy comprehensive exam before graduation this spring. Working on and completing my last group project for my Life Cycle Nutrition class. Successfully completing my last clinical course. Continuing to grow in my experience and working with new and continuing nutrition clients. And turning down my entrepreneur ‘what’s next’ business brain for when I have the ability to put my focus there. And then setting it all down and going to work, where I focus on teaching kids to cook and learn about the basics of healthy eating. And then dropping my energy into marathon training and keeping my body healthy. Layers. Like peeling an onion, my doctor said the other day, only she was talking about layers of healing. We all have these layers of aspirations, or obligations, or activities that we’re simultaneously putting our energy into and even though it might be nice to compartmentalize and separate them, they tend to bleed over and into each other. Or at least mine do. Over the last few years, I’ve tended to go in and out of stress reactions that will last a few weeks or more. I’m told they are really autoimmune-like flares, even though I’ve also been told I’m a touch too healthy to be diagnosed by conventional medicine, even with lots of ‘little signs’. Every time a flare happens I try to scramble and make sense of it, trying to identify the cause or the trigger, but ultimately when my physical body is a little too out of balance, my mental body becomes equally so, worrying and putting energy into the hurts and aches physically. And vice versa. And the two go round and round together, making the episode worse until I ultimately decide to set them both down, “give up,” and invest my energy elsewhere. That’s all to say that with two big end goals on the table right now, one being finishing my graduate program and the other the marathon that occurs just a few days after, I’m in a space right now of enjoying the process, enjoying the little things about the everyday today, and not getting so caught up in the what if’s or shoulds, or what’s next. It will come regardless. And for now, I’m eating lots of kitchari, even accused of making lentils and rice way too many meals in a row lately. But it’s what I’m craving and need after running in the rain or cold, or before rushing off to work. If you’re feeling like you’re holding lots of ‘layers,’ and could use a little space and pause for calming and grounding, I encourage you to turn off the noises around you that you can, tune into the ones that are still there (like family, the wind or rain, the heater), and immerse your senses in the process of cooking kitchari. Soaking the lentils and rice. Chopping the vegetables, measuring the spice. And then eat in the same fashion, for once without distraction, slowly, slowly. Tasting each bite. This works great as a quick lunch or dinner, and can use whatever vegetables you have on hand, or very few if you’re needing super simple. Double or triple the batch if you’d like, or just make this one for a couple lunch days when your partner doesn’t care to share in your need for more lentils and rice. Drain the rice and lentils if you soaked them. Then in a medium pot, bring them to a boil with about 3 cups of water and the spice mixture. If you’re tossing in hardier root vegetables, add them at this time too. Turn down, cover partially, and simmer for about 30 minutes. Check after about 20 minutes and add additional water as necessary and again at the 30 minute mark. After 30 minutes, add the greens or more tender vegetables and stir in, and then continue to cook 10 minutes more until everything is nice and porridge-like. Meanwhile, in a small fry pan, heat the coconut oil over medium heat and add the cumin, coriander, and fennel seeds. Cook just until they begin to turn golden and smell fragrant, about 2-3 minutes. Remove from the heat and pour them into the kitchari. Stir, add salt and black pepper to taste, and serve with some cilantro or parsley on top as desired. Add all the spices to a coffee or spice grinder and grind to a fine powder. Put into a labeled container and store away from light. we’ve been finding lots of delicious local flavors while in Boston, but I also love the adventure and challenge of making my own meals while traveling. it takes me right back to my days of living in 🇮🇪 with minimalistic ingredients and equipment, tiny kitchen, shopping at the grocery with the locals, navigating public transportation, and making something tasty from almost nothing. I finished(!! ), which today felt like a huge accomplishment. The issue that sidelined quite a bit of my last month of training decided to come out to play, and early on in mile 6 or 8 at latest. Given that and what ended up being hot and humid conditions that these west coast legs fresh off winter were not prepped for, I decided fairly early to just enjoy the experience, soak up the crowd, run with a big smile. Even though my mile splits and overall time didn’t show it, I actually felt really quite good in the last miles, better maybe than any other marathon, and that I would say is because the Boston crowds did not disappoint. I was definitely carried through and out of my own experience. Thanks to the best support crew of one (William) any girl could ask for, @oiselle teammates for all the in-race encouragement, @bostonmarathon crowds, coach @spencer.newell, and all y’all from cheering me on from afar. I could definitely feel the love today! Am so excited for this opportunity. The last few weeks of training have been a precarious adventure for sure. In it I’ve keep coming back to some borrowed advice from Ryan Hall’s pastor: ‘If you’re going to be a big dreamer, you had better develop equally big resilience.’ Whatever the day brings on Marathon Monday, I plan to run in the spirit of joy and celebration. Mad Hatter Tea Party at work today for our extensive extension volunteers! I went all sorts of experimental with this beet seed cake inspired by Nigel Slater. With a couple tweaks and actually writing down a recipe, this is one I hope to make and share again soon! back to my favorite early spring oatmeal bowl, packed with finely shredded beets, raisins, elderberry syrup + seed and spice add-ins. the ultimate use-what-you’ve got grain bowl. roasted a random bunch of veg, tossed in cooked chickpeas and lentils halfway through for a crispy texture. made a pot of mixed grains (millet, quinoa, buckwheat). made pesto with local dandelion and radish greens. tossed it all together (at room temp), and dinner and next day’s lunch was amazing.